At the end of this week, the second semester of Sketchbook Skool begins. I am pumped up. Are you? Click here to learn more. Danny I see you started lifting again… no juicing!! Author, artist, creative director and Mr. Olympia 2015. Hum… must say I enjoy the intriguing new direction of your marketing! LOVE THIS——and all of your posts—–LOVE SKOOL!!!!! LIFETIME MEMBER!!!!! I would love to do this! Great group of teachers and I like the format. I am signed up and ready to go! Can’t wait to start class from Provincetown, MA…the beach! 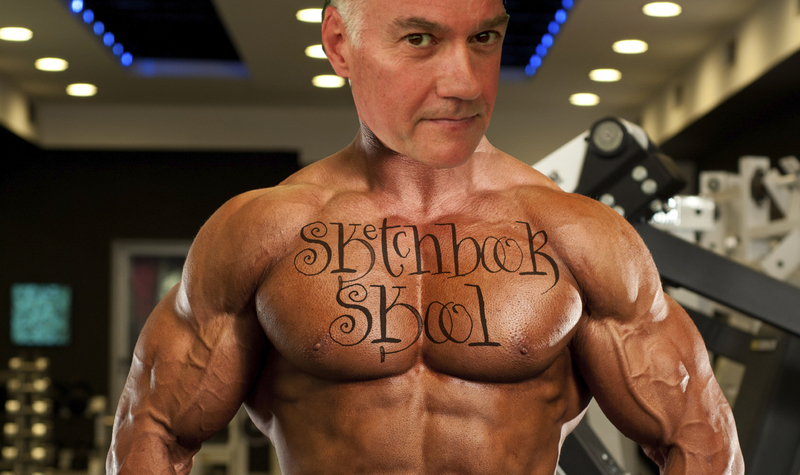 I may not look this muscular but my growth after semester one of sketchbook skool is as astounding! It’s a miracle place of wonder and delight! I cannot recommend it highly enough. I am sharing this with everyone I know! Omigosh. Laughed out loud at this just now, so loud I scared the cat! love these videos and love sketchbook skool. Well, I just couldn’t stand not being a part of both classes so I signed up for “Seeing” today…already have signed up for “Beginnings’…. I don’t think it will be too much, we’ll find out soon enough….for the next six weeks beginning on July 4th I think I am really going to enjoy myself….my son has signed up, and I gave the beginning class to my daughter for her birthday, and then my dear friend in Texas, Anne Treadwell (she is a watercolor artist) said yesterday that she was going to try and sign up for Beginnings also….so I have lots of support and we are all looking forward to the classes. I, am not really an artist, love to draw..and take photographs, have spent 20 years making quilts, bed quilts, table, quilts, wall quilts……all my friends have and family have been given all sorts of quilts and they love them but now, I think I want to slow down, and do some drawing and writing (and committing some of my fondest memories to paper ) before I really get old and forget them! Thank you Danny. Very excited about new semester. Signed up for both classes for semester 2. Will be ready for new one in October when that comes out.